Seta dyes are in general more hydrophilic than Square dyes and they are less environment-sensitive. The Seta dyes series spans the whole visible range and the NIR. Seta-375-NHS is an extremely bright, reactive label for use with the UV 375 - 380 nm diode lasers. It is much brighter alternative for Alexa 350 with a much higher extiction coefficient and quantum efficiency. Exc./Em. max: 372/480 nm. Seta-470-NHS is a fluorescent label perfectly suited for the 447, 457 and 473 nm diode lasers. It is a fluorescent viscosity probe for biomedical imaging and sensing applications and combines good solubility in water and aqueous buffers, high photostability, a large Stokes' shift and absorption and emission wavelengths in the visible range. Its extinction coefficient is 50,000 M–1cm–1 and it exhibits highly increased QYs after covalent attachment to proteins. Exc./Em. max: 469/515 nm. Seta-555-NHS is a direct replacement for Cy3, Alexa 555 or DyLight 550 and can therefore be used with these filter sets. Its extinction coefficient is 154,000 M–1cm–1 and the QY of Seta-555-NHS is about twice as high as that of Cy3. Seta-632-NHS is a better alternative to Alexa 633: it has an extinction coefficient of 280,000 M–1cm–1 as compared to 159,000 M–1cm–1 for Alexa 633. Extremely good acceptor dye for use in FRET applications with lanthanide (Sm(III)-)donors . Emitting bright red fluorescence this dye can be measured with the Alexa 633 filter set. Exc./Em. max of IgG-conjugates: 637/647 nm. Seta-633-NHS is a hydrophilic, mono-reactive label for proteins and other biomolecules. It is extremely bright and has a low tendency for self-quenching even at higher D/P ratios. The extinction coefficient is 250,000 M–1cm–1as compared to 159,000 M–1cm–1 for Alexa 633 or 170,000 M–1cm–1 for DyLight 633, and quantum yields as high as 70% were measured with conjugates of this long-wavelength dye. It is optimally suited to be excited with the 633 nm spectral line of the He-Ne laser or the 635 nm line of red diode lasers and replaces Alexa 633 and/or DyLight 633. Exc./Em. max of IgG-conjugates: 637/647 nm. It is well-suited as a label in fluorescence lifetime-based assays as shown below in the example of biotin. Seta-646-NHS is extremely bright (extinction coefficient is ~210,000 M–1cm–1, and the quantum yield of labeled antibodies are as high as 33% at a D/P ~ 1) and an ideal replacement of Cy5, Alexa 647, or DyLight 650 producing intense red fluorescence emission. It is also extremely photostable and can be optimally excited with the 647 nm spectral line of the Krypton-Argon laser. Exc./Em. max for conjugates: 650/661 nm. Seta-650-NHS is a brighter (extinction coefficient is ~200,000 M–1cm–1, and the quantum yield of labeled antibodies are as high as 33% at a D/P ~ 1) replacement for Cy5 or DyLight 650 producing intense red fluorescence emission. It is a highly photostable dye that is optimally excited with the 647 nm spectral line of the Krypton-Argon laser. Exc./Em. max for conjugates: 650/671 nm. 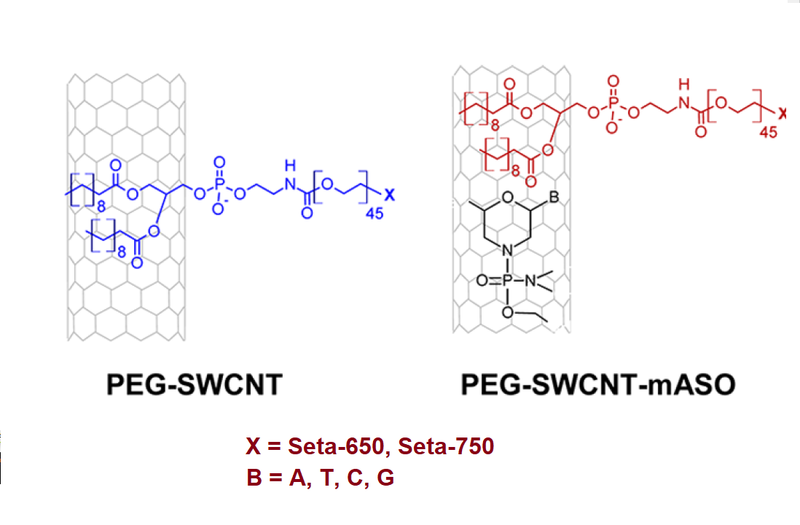 Seta-650 (K8-5035) and Seta-750 (K8-7522)-conjugated PEG-single walled carbon nanotubes (PEG-SWCNT-650 or PEG-SWCNT-750) were produced by labeling the PEG terminal amino groups on amino-modified PEG-SWCNTs with either Seta-650-NHS or Seta-750-NHS. 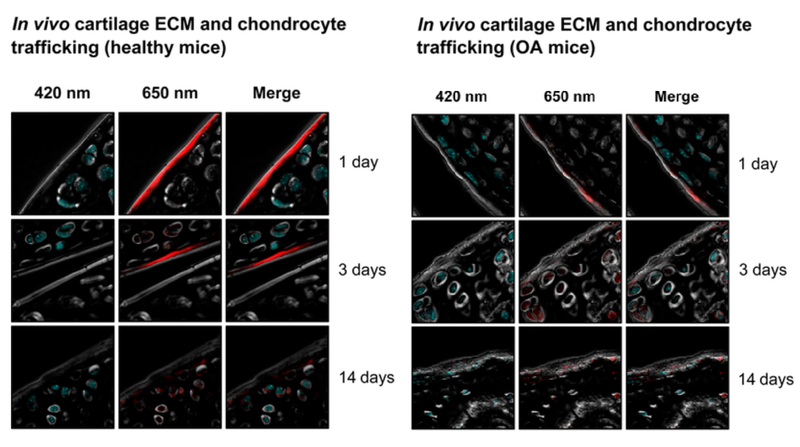 Cartilage ECM trafficking and chondrocyte internalization of injected PEG-SWCNTs: Polyethylene-Glycol-Modified Single-Walled Carbon Nanotubes for Intra-Articular Delivery to Chondrocytes, M. Bottini et al. ACS Nano , 2014, 8 (12), 12280–12291. Seta-660-di-NHS is much brighter alternative to Alexa 660: Its extinction coefficient is 220,000 M–1cm–1 as compared to 132,000 M–1cm–1 for Alexa 660, and quantum yields as high as 50% were measured from IgG-conjugates with this long-wavelength marker. It emits intense fluorescence in the far-red region of the light spectrum. Ex./Em. max: 661/672 nm. Seta-680-NHS is a dye that replaces Cy5.5, Alexa 680 or DyLight 680. The dye has an extinction coefficient of 200,000 M–1cm–1 as compared to 160,000 M–1cm–1 for DyLight 680 and its IgG-conjugates are bright and photostable. Ex./Em. max: 678/698 nm. Seta-700-NHS is a bright, water-soluble fluorescent label with a Q.Y. of up to 20% when labeled to IgG. Replaces Alexa 700 (QY = 0.13). Ex./Em. max (IgG-Conjugate): 694/710 nm. Seta-750-NHS is a hydrophilic, mono-reactive label with almost identical absorption and emission as Cy7 or Alexa 750 and can therefore be used with these filter sets. It combines high photostability and brightness. Replacement for Cy7, Alexa 750 and DyLight 750. Its extinction coefficient is 230,000 M–1cm–1. Ex./Em. max: 753/780 nm. 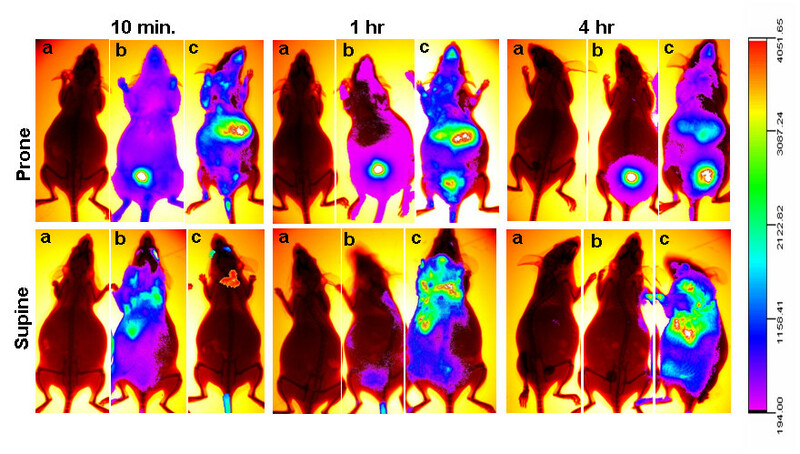 In-vivo analysis of the biodistribution of fluorescently labelled PEG-single wall carbon nanotubes: Panels show recording of fluorescence in mice injected with PBS (a) Seta750 (b) and PEG-SWCNT-750 (c). No fluorescence was recorded in control mice (a) at any time. Already 10 min after the injection, animals that received the fluorophore Seta750 alone (b) displayed fluorescence almost exclusively localized in the bladder. High fluorescence was recorded in liver and brown fat of mice administered with PEG-SWCNT-750 (c); one hour after the injection bladder accumulation of fluorescence was also visible in this group. From: M. Bottini et al. Biodistribution and toxicity of pegylated single wall carbon nanotubes in pregnant mice. Particle and Fibre Toxicology 2013 10:21. C. Sacchetti et al. Surface Polyethylene Glycol Conformation Influences the Protein Corona of Polyethylene Glycol-Modified Single-Walled Carbon Nanotubes: Potential Implications on Biological Performance. ACS Nano. 2013 Mar 26;7(3):1974-89. All dyes are available in the following formats: carboxyl, NHS-esters and maleimides.